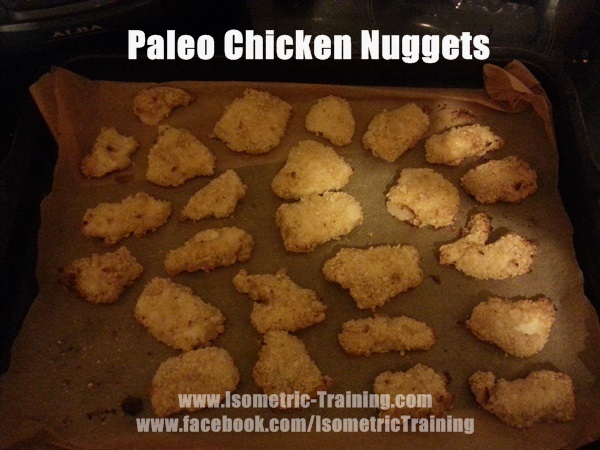 Paleo Chicken Nuggets are one of my weekly go to meals. They are simple, delicious, nutritious and completely support a Paleo based eating plan. Now I am not a strict Paleo advocate, but some of the paleo inspired recipes are just really damn tasty - like these. These Chicken Nuggets are packed with awesome protein, healthy fats, low carbs and just taste INSANELY Good. These are based on recipe I got from Diana Keuilian. You can watch me make them in the video below and after than I have the recipe details and cooking instructions. Cover a baking sheet with parchment / greaseproof paper. Combine the ground almonds, salt, pepper and paprika in a shallow bowl. Whisk the egg in another shallow bowl. Dip the chicken pieces in the egg mixture, and then coat in the almond mixture. Place on the prepared pan and bake for 15-20 minutes. Make the Chicken Nuggets above. Come back here and post how you much your enjoyed them below. I'll be looking for your comments. Finally, if you're looking for a more comprehensive program or more isometric exercise to do before your chicken nuggets check out my Perfect Body system.